Front Suspension Telescopic fork, 4.5 in wheel travel. Rear Suspension Swing arm, 2.6 in wheel travel. Looks Like Ifs Doing 100 mpg When It's Standing Still I Long gone is the ime when the major apanese motorcycle hanufacturers were attling it out in comat on the showroom oors and racetracks 'ith 50cc and l00cc nd 125cc motorcyles. The basic motor-|ycle went from 100 to 250 to 350 to 500 to 50ccs and with each increase there was a knaller and smaller selection of small reel motorcycles. Now. below 200cc. there is only one. The onda CBI25. It's been around since the |me when all the factories had 125 street kes. And it hasn't changed much over the pars, though this year it has bright red nders that go nicely with the tasteful Kline of the little bike. There not being any competition for the BI25. it manages to get along with the me I25cc sohc Single, live-speed transotos by Steve Kimball mission and combination pressed steel and tube frame. There's no electric starling or tachometer or turn signal cancelcr or disc brakes. This is a very basic motorcycle. Big holes not costing any more to make than little holes, the only way Honda could sell the CB125 for less money than Yamaha does the SR500 is to leave off some of the features and cut costs wherever possible. And there just aren't that many parts on a Single that can be left off. Particularly with a sohc Single. Of course there are no counter-rotating balancer shafts on the 125 such as those of the large Honda Singles. Nor are they needed. On the engine is the most basic of 22mm slide valve carburetors and an ordinary battery and points ignition. This is all basic stuff, stuff that's worked for years and is easy to maintain. Valve lash is set with a screw driver and wrench. For maximum performance you shift when the speedometer needle reaches the shift mark. Little motorcycles naturally get stigmatized. So do big motorcycles, but the stigma isn't so offensive. Little motorcycles lend themselves to beginning riders because they are light and less intimidating than bigger machines. All the controls are within the power of smaller" people, so small folks like the son who's not fully grown and the wife who can't reach the ground on the dual purpose bike can feel at home on the CBI25. Put in the right perspective, however, the 125 becomes fun (if not exciting) to those used to much bigger machines. When was the last lime you were engaged in a contest Of speed and didn't have to worry about getiing a ticket? Heck, on the Honda 125 every stoplight is a drag race and the competition is in Honda cars and Volkswagen busses and Buick sedans. The CB125 will win those races, too. but mostly because people in cars don't drive as fast as they can. Still, there's a thrill in seeing traffic fade slowly in the rearview mirrors as the Honda is thrashed to the shift points in every gear. At least in town the traffic fades pleasantly back. Out on an open road the story is reversed as the Honda has all it can do keeping up with the flow of cars doing 60. Because the performance is so modest, the 125 lends to be ridden flat out all the time. People who usually refrain from such practices found themselves powershifting into second gear to pop the front wheel in the air. Other benefits of the 125 size came when traffic backed up and the 125 rider could slip between the lanes on even narrow streets. The brakes on the CB125 are worth mentioning, but that's not something positive. It's a 10 horsepower motorcycle with five horsepower brakes. One rider took the 125 to the bank and came back wanting tc know what was wrong with the front brake He didn't think it had one. At both ends ol the small Honda there are tiny drurr brakes, each one with 13 sq. in. of brake area. The rear brake manages to do its jot because there's lots of leverage for a strong fool and the rear end of a motorcycle doesn't do much stopping anyway. Up front there's a shorter lever for a hanc that's not as strong as a foot and the brake is the same size so little happens when i rider grabs the lever. Considering this is a beginner's motor cycle, the brakes will only teach the ride: that he can't pull the front brake too hard but it could also teach the rider that it's no worth pulling it at all. Before the othei factories got out of the small street bike market. Honda had a disc brake on th« front of the 125. Now that there's n< competition, there's the tiniest of drums. The clutch is also marginal. It can't b< held in until the signal changes because i warms up and begins to grab. When lh< engine is revved up before taking off th< clutch can object with peculiar noises Even during gentle riding the clutch leve moves a long way. slowly taking hold before it all-of-a-sudden grabs. Beginnin| riders deserve better. Starting the 125 is simple, but not a: easy as other small motorcycles have been The lever is short and needs more pressun than a small two-stroke needs to kick i over. Once moved, the Honda starts withii a couple of kicks, hot or cold. When cold however, the choke must remain on for i few minutes or the cycle will die. but when ridding the bike the choke has to be turned olf so the engine will rev. Cold running could certainly be improved. Once when he Honda was kicked over it backfired and refused to start. The frustrated rider gave up and took an easy-starting Yamaha 5R500 home for the night, discovering the next morning that the backfire had blown the plastic top off the 125*s carburetor, taking the slide with it. The plastic carb top had simply broken in two. Another excessively cheap part. , Suspension? Yes. there is some. Again, t's what you'd put on if you couldn't sell he bike for as much as you'd like. Travel is 1.5 in. front and 2.6 in. rear, with springs tiff enough to keep a normal size person rom bottoming the shocks but still able to ibsorb the shock from big holes. Rear pring preload is adjustable, the only ad-ustment on the suspension. Considering he spindly forks and tiny shocks, the uspension works better than it should. Handling is a mailer of trust. How much oes the rider trust the 18 in. Bridgestone n front and the 17 in. Nitto in back? craping the pegs on the 125 would be a latter of bravery, not skill. Honda makes a 25 roadracer. but this isn't it. The 47 in. heelbase and 200 plus pounds of motor-ycle make for a flighty sort of motorcycle, ne that will turn instantly at the slightest rovocation and ihe quickness increases as >eed slowly builds. The CB125 is economy transportation. Ildid 78 mpg on the CM test loop, the best result since we began doing repeatable miles-per-gallon tests. And the loop is a bit unfair to small engines, as thev are working hard on the highway portions that allow superbikes to cruise with throttles barely cracked. In intended service, for example running errands, shorl hops to school and store, the 125 would be even belter. (A minority comment here, from those who recall that the old 500 Twins, as in Triumph, used to return almost as man) miles per gallon. A mild, slow-turning large engine can be as efficient as a small, high-rewing engine.) But overall, the CBI25 is our mpg champ to date. One reason it's so tough to build a good small motorcycle is the amount of safety equipment required on a street bike. The reflectors and two brake light switches and signal lights and the emission certification cost as much on a small bike as on a large bike and the required equipment becomes a greater part of the motorcycle's cost. There's a curious blend of features and lack of features on the 125. There's a helmet lock and tool box hanging below the seat on the right side. A grab strap runs across the seat. Two pods contain the speedometer/odometer in the lefthand pod and warning lights for turn signals, high beam and neutral in the righthand pod. There is no oil pressure warning light or sight gauge for checking oil level. No trip meter. The 35 watt headlight only seems to work on well lighted streets. It would be appropriate on a moped, perhaps. Yet there's a locking cover over the gas tank filler that surely requires more parts and more cost than a simple locking cap that would also be easier to use. When Honda came up with the revised XL 125 a couple of years ago. it would have seemed natural to stick the improved 125cc engine in the CB at the same time. After all, the CDI, six-speed transmission and better carburetor cost little extra and one engine could have cut production costs. Instead. Honda changes the CB125 by adding rectangular turn signals and redesigned clutch and brake levers and hand lever dust covers and new fuel tank striping and sidecover emblems and improved seat styling. 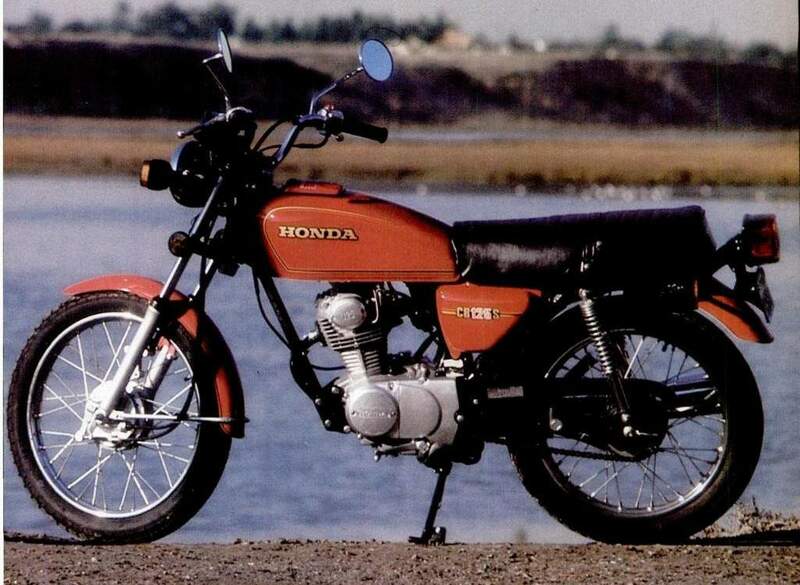 All those changes make for a more attractive motorcycle and Honda is betting that the inexperienced rider who will buy the CB125 is more interested in the better styling than he or she would have been in improved brakes and clutch or better tires. Honda, as usual, is probably right.